Radiation Technology for Advanced Materials presents a range of radiation technology applications for advanced materials. The book aims to bridge the gap between researchers and industry, describing current uses and future prospects. It describes the mature radiation processing technology used in preparing heat shrinkable materials and in wire and cable materials, giving commercial cases. In addition, the book illustrates future applications, including high-performance fibers, special self-lubricating materials, special ultra-fine powder materials, civil fibers, natural polymeric materials, battery separator membranes, special filtration materials and metallic nanomaterials. 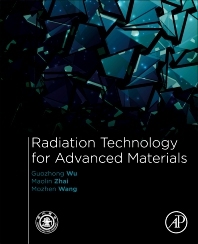 Chapters cover radiation technology in high-performance fiber and functional textiles, radiation crosslinking and typical applications, radiation crosslinking for polymer foaming material, radiation degradation and application, radiation emulsion polymerization, radiation effects of ionic liquids, radiation technology in advanced new materials, and future prospects. He received his B.S. degree (1992) in radiation chemistry from University of Science and Technology of China, and Ph.D degree (1998) from the University of Tokyo (Japan). He has been working in Shanghai Institute of Applied Physics since 2002. His team focuses on radiation chemical reactions and radiation modification of polymer materials, as well as radiation processing. He has been working on radiation modification of polymers for many years and accumulated a lot of experience in radiation research and its industrial applications. Radiation technique is unique and useful in material industry, with the development of economy of China, the application of radiation technology will be expanded and more advanced materials will be innovated. This is the motivation we made many efforts to edit this book. He has been working on radiation chemistry for more than 20 years, owning a wealth of experience and knowledge in the field of radiation technique. His research focuses on radiation syntheses of graphene nanocomposites, intelligent gels and ion exchange membranes, as well as radiation effect of ionic liquids and polymers. He has been as a chief editor or editor of the published several monographs (Zhai Maolin, Zhao long, Huang Ling, Xu Ling, Yuan Liyong, Wang Min. Chitin, Chitosan, Oligosaccharides and Their Derivatives: Biological Activities and Applications. Chapter 31 Radiation Functionalization and Applications of Chitosan and Its Derivatives, CRC Press, 2010; Zhai Maolin, Yi Min, Ha Hongfei,《Radiation Processing Technology of Polymeric Materials and Its Progress》, Chemical Industry Press, 2004, In Chinese). In addition, he has published 150 papers with citation times of about 2300, authored and co-authored 9 scientific monographs and text books, and held 20 patents. She has engaged in the research work on the principle and application of radiation-induced emulsion polymerization for nearly 15 years, and is an expert in the synthesis of anisotropicand/or porous materials through the assembly and radiation chemistry reactions in multiple systems. The author has published more than 50 papers on international academic journals involving the radiation synthesis of polymer or polymer/inorganic composite microspheres and radiation modification of polymer materials.